If there’s one dish that tops the “must-eat” list of visitors to Singapore it’s chilli crab. 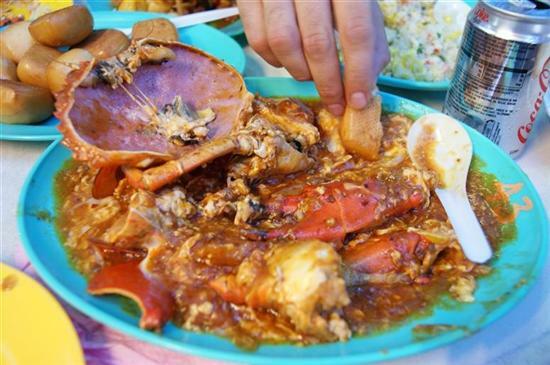 Whether you eat it in a hawker centre or a posh seafood restaurant, digging into a whole crab swimming in sweet and spicy sauce is the most memorable (and messy) meal that Singapore has to offer. Singapore chilli crab -- go ahead, get your hands dirty! Unlike most hawker dishes, which originated in countries like China or India, the chilli crab is a true Singapore creation and the recipe was only developed in the 1950s. There is some debate about exactly who created it, but the credit is generally given to Palm Beach Seafood Restaurant. Needless to say, the dish was a hit and the Singapore chilli crab has become so iconic it can be found on postcards and souvenirs. The appeal of the chilli crab is all in the addictive sauce: a mix of tomato, egg and lots of spices. Though one of them is definitely chilli, the other ingredients balance it out and chilli crab is not overwhelmingly spicy. The crab is then stir-fried in the delicious sauce and served with rice or man tou (Chinese fried buns) to mop up every last drop. If you’re interested in mastering the art of chilli crab, a few cooking schools in Singapore offer lessons. The crab shell is only partly cracked, so you’ll need to get your hands dirty to get to the good stuff inside. Do not wear your favourite white shirt to a dinner of chilli crab and, if eating at a hawker centre, remember to bring some tissues for wiping the red sauce from your mouth and fingers! Like most fresh seafood dishes, the price of chilli crab depends on the market. The price is usually quoted per 100 grams and varies depending on the type of crab, the season and what kind of place you’re eating at. At a heartland hawker centre a small mud crab might cost as little as S$25, while a monstrous Sri Lankan crab can cost S$80 at one of the tourist-y Clarke Quay seafood restaurants. 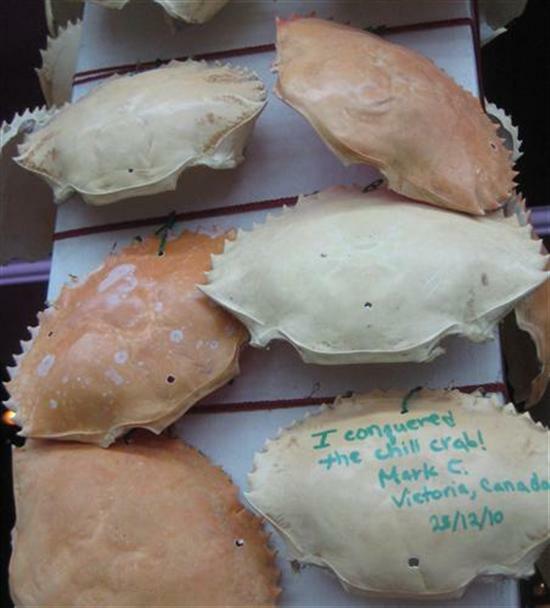 To avoid bill shock always ask the price before ordering and you can even specify the size of crab you want.